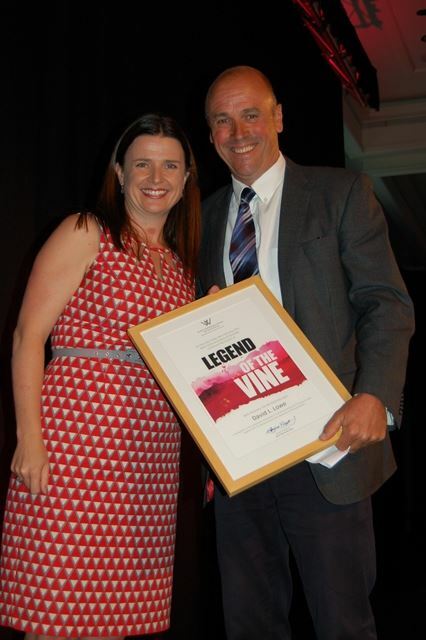 Wine Communicators of Australia (WCA) has announced the inaugural 2014 Legend of the Vine Award recipient as Mudgee winemaker and well-known NSW wine advocate David Lowe. Mr Lowe received the award in front of an audience of 365 wine industry peers, at the WCA Sydney Royal Wine Show Trophy Winners Lunch on Friday, February 14, held at the Four Seasons Hotel, in Sydney. WCA Chair Angie Bradbury said WCA wanted to create an Award that acknowledges the passion, drive and leadership, particularly in communication, of a highly regarded individual in the Australian wine industry. “WCA’s maxim is ‘Engage, Connect, Learn, Inspire’. This industry has plenty to be inspired about and that includes the number of individuals who lead by example and add their own skilled and distinctive voice to the Australian wine story – and our inaugural Legend of the Vine is an outstanding example of this,” Ms Bradbury said. Announcing the award at the Sydney lunch, Ms Bradbury described Mr Lowe as being “an inspiration to many” during his ongoing 35-year career in the wine industry. “Mr Lowe is one of Australia’s leading wine industry figures and represents the sixth generation of his family in custodianship of the land his vineyard is planted on,” she said. “Graduating from Roseworthy Agricultural College in 1979 with a Bachelor of Science (Oenology), Mr Lowe went to the Hunter Valley and was appointed assistant winemaker at the prestigious Rothbury Estate in the Hunter Valley working for two titans of the wine industry, Len Evans and Murray Tyrrell. “Through turbulent but rewarding times, he progressed to become chief winemaker and group vineyard manager, significantly expanding Rothbury’s production through innovative viticulture that included trellising, canopy management, fruit irrigation and water management. “At that time Mr Lowe also undertook vineyard risk management research that led to his identification of Orange as an alternative cool climate grape growing region. He is a wine consultant and an accredited wine show judge, regularly participating at national shows, including Canberra, Hunter Valley and Cowra. “During his 35-year career he has been the recipient of industry awards, trophies and medals, including Best Zinfandel at the 2003 International Wine Challenge (runner-up in 2004) and the Qantas Cup for the Best Australian Chardonnay (1985). “Mr Lowe is a prominent wine industry advocate and holds several key positions including vice president of the Winemakers’ Federation of Australia; member of the strategic NSW Ministers’ Wine Advisory Council, vice president of the NSW Wine Industry Association and president of the Mudgee Wine Grape Growers Association. As the 2014 recipient, David Lowe received life-time membership to WCA, joining a highly-respected list of names, which includes Phil Laffer, James Halliday, Chris Anstee and Lyndey Milan. The 2014 ‘WCA Legend of the Vine Award’ is nominated by the WCA Board and State Chapters, with the winner chosen by the Wine Communicators of Australia Board.